4. TSMSCET for 6th to 10th Classes admissions in TS Model Schools in Telangana State. 1. TGCET 5th Class Entrance Test: TS Gurukul CET, TG Gurukul CET, TS SC ST BC Gurukul CET, TREIS, TSWREIS, TTWREIS, TSBCWREIS TGCET 5th Class Entrance Test. 1. 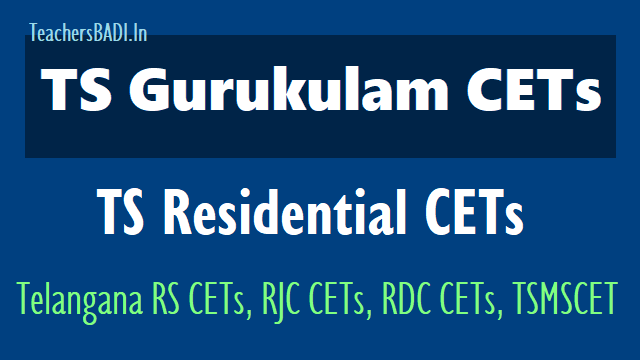 TSRS CET 6th, 7th Class Entrance test (TSRS Gurukul CET). 1. TSWREIS 6th,7th,8th,9th class Entrance test, TSWREIS RS CET, TSWRS Gurukul CET, TS SC Gurukul CET. 3. TSWRS RDC CET, TSWREIS RDC CET, TS SC Gurukul RDC CET, TSWRDC CET for Degree 1st year admissions. 3. TTWRS RDC CET, TWREIS RDC CET, TS ST Gurukul RDC CET, TTWRDC CET for Degree 1st year admissions. 1. TSBCWREIS 6th,7th,8th,9th Class Entrance test, TSBCWREIS Gurukul CET, TSBCWRS Gurukul CET, TS BC Gurkul CET. 3. TSBCWREIS RDC CET: TS BC Gurukul RDC CET, TSBCWRS RDC CET, TSBCWRDC CET for Degree 1st year admissions. MJP TC BC Welfare RDC CET: MJP TC BC Welfare RDC CET 2019 is a Common Entrance Test for admission into Degree courses in MJPTBC Welfare Residential Degree College for Women located at Wargal X Roads, Behind MARS Company, Wargal, Siddipet District for the Academic Year 2019-20 from the students appearing for Senior Intermediate Examinations from 33 Districts of Telangana State. 1. TMREIS 5th, 6th,7th,8th,9th Class Admissions: TMRS Minority Gurukul CET, TMRS CET, TMREIS Gurukul CET, TMREIS Gurukul Admissions. 2. TMREIS Inter 1st year admissions: TMREIS RJC Admissions, TM RJC CET,TM Gurukul RJC CET, TMREIS RJC CET. 1. TSMS 6th,7th,8th,9th,10th Class Entrance test. 2. TSMS Inter 1st year admissions.